Canine C-reactive Protein (cCRP): biomarker for systemic inflammation and tissue damage, particularly in neoplastic and immune-mediated diseases. 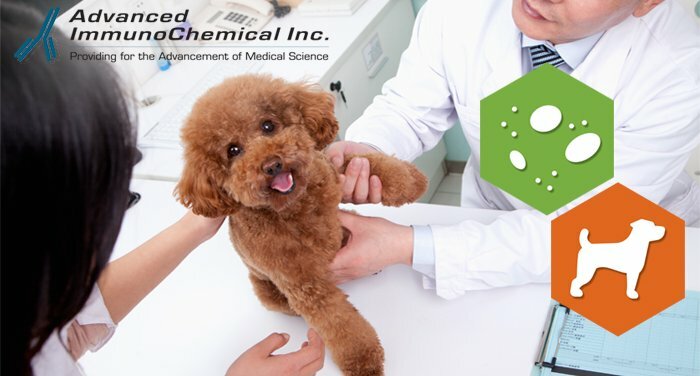 - Advanced ImmunoChemical Inc.Advanced ImmunoChemical Inc.
Home » Article » Canine C-reactive Protein (cCRP): biomarker for systemic inflammation and tissue damage, particularly in neoplastic and immune-mediated diseases. Acute phase proteins (APPs) constitute a group of proteins whose blood concentration changes rapidly in response to stressors such as infection and tissue damage. C-reactive protein (CRP) is a representative APP with synthesis in hepatocytes greatly increasing during systemic inflammation and in various disorders including viral and bacterial infections, sepsis and surgical trauma (1-3). Advanced ImmunoChemical offers several monoclonal antibodies (MAbs), along with the corresponding recombinant antigen for research and assay development of canine CRP. Anti-canine CRP MAbs recognize CRP in dog serum with high sensitivity and specificity and are not sensitive to the presence of EDTA. Applications include sandwich immunoassay, direct and indirect ELISA, and Western blotting with no cross-reactivity with other dog serum components or to human CRP. In addition, our recombinant canine CRP can be used as a calibrator in canine CRP immunoassays. Click. AssayNotes: Canine C-reactive Protein, biomarker for systemic inflammation. It has been shown that canine CRP is a glycoprotein with 2 of the 5 pentomeric subunits glycosylated. Our recombinant canine CRP migrates under SDS-PAGE as two separate bands under reducing conditions, similar to native CRP. (See AssayNotes above). Kjellgaard-Hanson, M. Canine CRP- a study on the applicability of canine CRP. Ph.D. Thesis. 2004. The Royal Veterinary and Agricultural Univ., Denmark. Ceron, J.J., Eckersall, P.D., and Martynez-Sublela, S. Acute phase proteins in dogs and cats: current knowledge and future perspectives. Vet. Clin. Pathol. 2005, June; 34 (2): 85-99. Eckersall, P.D. and Bell, R. Acute phase proteins: Biomarkers of infection and inflammation in veterinary medicine. Vet. J. 2010. 185:23-27.